Ngaran Ngaran Culture Awareness (NNCA) was established in 2011 and is an Aboriginal owned and operated Cultural service provider on the South Coast of NSW, near Narooma and the Tilba region on Yuin country. Your lead guide is Dwayne ‘Naja’ Bannon-Harrison with over 17 years of experience, along with nine generations of cultural teachings passed down. Dwayne and the family team at NNCA invite all walks of life onto Yuin country to learn and immerse yourself in the world’s oldest living culture. The Gulaga Creation Tour is a 40 hour experience that starts on the evening of day one, and ends mid-morning on day three. Gulaga Mountain and many parts of the Narooma region have held sacred significance for the Yuin Aboriginal community for tens of thousands of years yet the stories are not widely known. The traditional custodians of Yuin country - Ngaran Ngaran Culture Awareness invite you to come, walk and listen to a sacred dreaming of creation that Gulaga holds, and enable you to experience firsthand ceremony and dreaming stories that have been passed down. 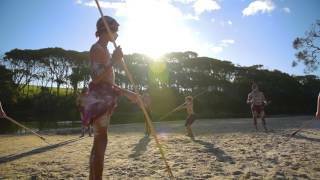 Book your place for the most unique experience of South Eastern Aboriginal culture.